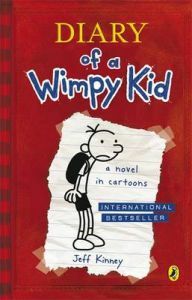 The hilarious and original global bestseller Diary of a Wimpy Kid - perfect for readers of 8+ and also reluctant readers, everyone loves the adventures of Greg Heffley. You can also discover Diary of a Wimpy Kid on the big screen in the major motion blockbusting Wimpy Kid Movie franchise. Let me get something straight: this is a JOURNAL, not a diary. This was Mom's idea, not mine. But if she thinks I'm going to write down my "feelings" in here or whatever, she's crazy. The only reason I agreed to do this at all is because I figure later on when I'm rich and famous, this book is gonna come in handy. But for now I'm stuck with a bunch of morons. Today is the first day of school, so I figured I might as well write in this book to pass the time. Just don't expect me to be all "Dear Diary" this and "Dear Diary" that. Praise for Jeff Kinney: 'The world has gone crazy for Jeff Kinney's Diary of a Wimpy Kid' - Sun 'Kinney is right up there with J K Rowling as one of the bestselling children's authors on the planet' - Independent 'The most hotly anticipated children's book of the year is here - Diary of a Wimpy Kid' - Big Issue 'Hilarious' - Telegraph Jeff Kinney is an online game developer and designer, and a #1 New York Times bestselling author. Jeff has been named one of Time magazine's 100 Most Powerful People in the World. Jeff is also creator of Poptropica.com, which was names one of Time magazine's 50 Best Websites. He spent his childhood in Washington, D.C., and moved to New England in 1995. Jeff lives in Southern Massachusetts with his wife and their two sons. As well as being an international bestselling author, Jeff Kinney is also an online developer and designer. He is the creator of the children's virtual world, poptropica. He was names one of Time Magazine's 100 Most Influential People in 2009. He lives with his family in Massachusetts, USA.